"THEY RALLY ROUND THE FAMILIES!" 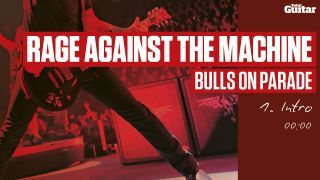 Pick up Total Guitar issue 217 (on sale 8 July to 4 August) for an exclusive interview with Tom Morello in which he tells TG all about the mindset and musical approach behind one of Rage's most explosive moments. There's also a backing track, a guide to nailing the guitar tones and the scales and chord diagrams from the tune. Composed by Tom Morello, Timothy Commerford, Zack M De La Rocha and Brad J Wilk. Every song has a story. Where possible we speak to the musicians and studio technicians to explore the inspiration, as well as the writing and recording processes behind your favourite songs. As well as a backing track, every song comes with easy-to-read illustrated settings for amps and effects. This enables you to not only play classic riffs, solos and tunes, but to replicate the tone, too. Every song you learn in the magazine comes with a backing track on your CD, so you can play the guitar parts along with a full band. The CD is just that, a CD of music, so you can play it anywhere and easily transfer the songs to your PC or MP3 player.